It has never been tougher to build and sustain a successful food & beverage business than it is today. Even with a (hopefully) recovering economy, doing business is challenged on the home front by regulatory changes, raw material pricing, corporate sustainability goals and changing consumer demands, among others. And on the global front by the difficulty (but seeming necessity) to set up foreign operations, safety and reliability of offshore suppliers, impact of currency fluctuations and competition for talent. For consumers, convenience is by far the most important dynamic, and will continue to be so over the next five to 10 years, according to any number of prognosticators. Consumers are willing to pay more for convenience as their work habits and lifestyles change. The same can be said even for shoppers in developing nations. It's a tradeoff many are willing to make, especially as disposable income rises in many countries. It's all about time, and the consumer would rather buy time than prepare food. Healthy eating is another critically important consumer driver, a trend that has considerable influence over company strategies. But while consumers want "healthy," they often don't buy healthy … or aren't willing to pay for healthy … or don't even know what healthy means and are easily confused. "2011 brought us higher food prices at unprecedented levels, in part because of crops and livestock being destroyed by global weather catastrophes," says Supermarket Guru Phil Lempert. "We will continue to see higher prices, but we will also see all the different ways Americans love their food - in supermarkets, on television, at restaurants and now even on their mobile phones. We are on the verge of what may be one of the most exciting and game-changing years in the food world." Food prices will keep rising, leading consumers to use printable grocery coupons, frequent shopper cards and shopping lists. In addition, there will be increased shopping at non-traditional food stores and trading down to less expensive options. Look for consumers to shave costs by augmenting their recipes by decreasing the amount of the more expensive meats and seafood and adding more non-meat proteins that are filling and less expensive, including whole-wheat pasta, tofu, lentils, brown rice and vegetables to recipe. Never eat or shop alone -- The use of food blogs has set a foundation for group food experiences. In addition, food trucks often tweet their locations, leading to flash crowds. These experiences are not necessarily about food but about connection, conversation and a sense of community. Baby boomers keep right on trucking -- This crowd of 76 million people will be the largest food influencers and purchasers and will control 53 percent of the total $706 billion spent on groceries by 2015. Manufacturers and supermarkets will continue to target this crowd. The baby boomer generation (which comprises shoppers aged 48 to 65) is expected to have a longer average lifespan -- 74.1 years for men and 79.5 years for women -- and as a result are becoming more interested in those foods and beverages that offer them health and wellness benefits. Increased emphasis on the farm to fork journey -- Shoppers will continue to ask questions about where their food comes from, and there will be an added emphasis on the role of the farmer. End of the checkout lane -- Shoppers are enjoying self-checkouts, comparing prices at nearby retailers, cell phone scanners, in-store interactive media devices, QR codes, RFID and mobile coupons, the GS1 DataBar standards are impending, and barcode scanners need to be updated, which is a huge investment. At the same time chains including Wal-Mart are pushing suppliers to add RFID chips to individual items. Ethnic food revolution -- Food trucks will boost interest in foods from around the world. New role of the male shopper -- Men want to be engaged parents and successful professionals, and 41 percent of them are cooking compared with half that amount in 2003. Eating at home equals extreme home cooking -- There will be another slowdown in food service as there is more eating at home, and the everyday cook will take pride in making the most food for the least money. How sweet it isn't -- Reduced sugar will be one of the biggest health claims in the coming year. Listen for the sound of food -- Consumers will judge the readiness of some foods, such as popcorn and grilled burgers, by the sounds they make. Multisensory perception will be one of the new "food sciences" in 2012 as psychologists and food scientists join forces to design, create and influence the sounds of our foods to convey freshness, taste and even health attributes. Healthy means different things to different people. Two important demographics that likely will have a 2012 impact on food production and shopping are baby boomers and those of all ages who suspect food allergies. Living longer, fitter and still working, an aging population means grocery store shelves will contain foods that come with added health claims, predicts UK-based market research group Leatherhead Food Research (www.leatherheadfood.com). Expect to see more products with glucosamine for joint health and foods with added omega-3 for brain and heart health. Artery-cleaning products are also poised to make a breakthrough in the functional food market and seduce older consumers with promises of cardiovascular benefits. At the same time, younger consumers with food intolerances will drive demand for gluten-free, nut-free or dairy-free foods in 2012. The crux of this market lies within the seemingly growing number of consumers who do not have a diagnosed food allergy but believe their general health improves with the omission of certain food ingredients such as wheat/gluten. This is an opportunity for both mainstream manufacturers to highlight additional product benefits as well as allowing the traditional ‘free from' brands to break the niche, they've traditionally operated in. "Nutrition – especially when it comes to children – is becoming a major focus for the nation's nearly one million restaurants," says Joy Dubost, director of nutrition & healthy living for the National Restaurant Association. Leatherhead also predicts 2012 will see more food & beverage manufacturers improving the health and wellness, in part to meet various nutritional guidelines. That will mean reducing salt, fat and sugar and enhancing (and promoting) the health benefits in their foods. "2012 looks set to be one in which ongoing trends will be stretched to their full potential, particularly as consumer concerns about health and wellness have prevailed and continue to be high on the agenda," says Laura Kempster, senior market analyst at Leatherhead. "Coupled with this, the uncertain economic future continues to affect both industry and consumers with a ‘tightening of belts' attitude still very much affecting spending and investment." Consumers have learned in recent years not all fats are bad for you, and, in fact, some are important to good health. Thanks to recent studies indicating that certain fats (monounsaturated and polyunsaturated fats) can lower disease risk, "good" fats as a component of food have left the nutritional doghouse. As a result, consumers who had embraced low-fat diets for years are returning to foods and beverages that feature the better-for-you fats. "Increased consumer demand has prompted manufacturers to bring new foods and beverages to market touting healthy fats and oils content," says David Sprinkle of New York-based Packaged Facts (www.packagedfacts.com). "And these products have sold well enough, even in tough times, that they've emerged as relatively recession-proof compared to other food categories. Some may point out that many fats and oils, such as butter, margarine, and cooking oils, are household staples that consumers will always buy, but make no mistake, this newfound health perspective is driving sales." Hartman Group (www.hartman-group.com), Bellevue, Wash., finds consumers increasingly understand wellness to be a "positive" proposition rather than a "perfunctory" one, a cultural shift from "health" toward "quality of life." Non-physical notions of well-being (mental, emotional and spiritual) are just as important as physical well-being for consumers, the market research firm notes in its "2011 Health and Wellness Deep Dive" report. Quality of life accommodates variation in individual desires, needs, lifestyles and goals and illuminates the role of indulgence and pleasure as essential components of wellness. Probiotics seem to bridge the gap between naturally healthy foods and those with ingredients added to support health -- nutraceuticals. The yogurt market, the original home to probiotics, is growing by double digits, and the beneficial bacteria are popping up in other dairy products, juice drinks, bars, chocolate, energy drinks, teas, even dog food. Even beverage manufacturers can now provide consumers with probiotics to benefit the immune and digestive systems – and without a refrigerated supply chain. Cleveland-based Ganeden Biotech (www.ganedenlabs.com) and Australia's Unistraw International Ltd. (www.unistraw.com) are partnering to include the probiotic GanedenBC30 into Unistraw's straw delivery system. When the economy is weak, most consumers cut back on nonessentials and instead spend their money on little luxuries, such as, lipstick. That's exactly what happened during the 2001 recession, when lipstick sales soared even as the overall economy declined. These days, the so-called lipstick index (a term coined a decade ago by Estée Lauder (co-founder of cosmetics giant Estée Lauder Cos.) seems to indicate more tough times to come. Lipstick sales were up 14 percent last year. And nail polish, which more recently has become a bellwether of economic turbulence, has risen an even more disturbing 54 percent, reports Time. Whether times are good or bad, we all try to nail the trends. For those looking for new product development inspiration, marketing savvy and future financial investment, the trick is not to be too far ahead of the consumer, but certainly not too far behind competitors. Yes, trend prognosticating is a sticky wicket, but finding out what global and U.S. consumers want, or think they want, is no longer a luxury. Speaking of luxury, "bespoke" is the new buzz word in the luxury market as people search for customization in a mass-market world, according to San Francisco-based Andrew Freeman & Co. a foodservice and hospitality consulting agency. Give people the opportunity to customize their experience and show the extra care and personalization that comes with it. Unistraw's product contains hundreds of UniBeads housed within the straw. The probiotics are dry and shelf stable but dissolve as liquid is sipped through the straw. Juice, milk, carbonated drinks and water can all be turned into probiotic beverages that no longer need refrigeration and have a shelf life of up to 12 months. The straw is also recyclable. While added nutraceuticals seem to be a luxury of the developed world, they're growing faster in the developing world, according to "World Nutraceutical Ingredients," a report from Cleveland-based Freedonia Group Inc. (www.freedoniagroup.com). These ingredients have clinically confirmed health benefits and broad applications in foods, beverages, dietary supplements and adult and pediatric nutritional preparations. Increasing economic prosperity will enable the BRIC countries of Brazil, Russia, India and China, as well as Mexico, Poland and South Korea, to expand and diversify their food & beverage offerings to include nutraceuticals. Based on projected investment levels in these industries and rising consumer incomes, China will evolve into the largest global producer and consumer of nutraceutical ingredients by 2020, surpassing the U.S. and Western Europe, says Freedonia. Nutrients, including proteins, fibers and various specialized functional additives, will remain the top-selling group of nutraceutical ingredients. Proteins will post the fastest gains as food & beverage makers throughout the world introduce new high value-added nutritional preparations. Functional additives and fiber nutrients also will fare well. Naturally derived substances, consisting of herbal and botanical extracts and animal- and marine-based derivatives, will command the fastest growth among the major groups of nutraceutical ingredients. The next big eco-issue will be the impact of our food choices on the environment – so says New York City-based-JWT (J. Walter Thompson Co.), a marketing communications company (www.jwtintelligence.com), in its seventh annual year-end forecast of key trends that will drive or significantly impact consumer behavior in the year ahead. Consumer interest already exists, small but growing. The agency says various stakeholders -- brands, governments and activist organizations – will join in and further raise awareness around the topic, making everyone rethink how (and what) food is sold and how it's made. As more regions battle with food shortages and/or spiking costs, smarter practices around food will join the stable of green "best practices." The greening of food continues, with packaging reduction initiatives, more ethical sourcing policies and the reduction of food miles, says Leatherhead. Corporate social responsibility reports have become as necessary (and voluminous) as annual reports and 10-K statements for food & beverage companies, and most lean heavily toward environmental issues. It seems every company has a long-term plan for reducing its environmental impact … and who can argue with that? A cardboard beverage can that can hold beer, sparkling soft drinks, juices and coffee drinks will be available next year, according to its producer Germany-based Keienburg GmbH, reports www.foodproductiondaily.com. The can, made of a multilayer board, is a cheaper, environmentally friendly alternative to aluminum cans, is less expensive to transport, and may eventually be applied to party kegs and other canned foods. "Heinz is on track to achieve or surpass our goal of reducing greenhouse gas emissions, solid landfill waste, energy consumption and water consumption by at least 20 percent each by fiscal year 2015," Heinz Chairman, President and CEO William Johnson says in the introduction to his company's CSR report. "Our Global Sustainability Process is driving continuous improvement in these four key environmental areas that are strategic priorities for the company." But in the past year or so, the definition of "sustainable" has included the economic sustainability of the corporation. "Air. Water. Natural resources. These are things we all share. And we want to do our part to make sure we can keep doing so for a long, long time," reads the introduction to ConAgra's CSR. ConAgra puts a big emphasis on ROI for its sustainability projects, as we detailed in our Green Plant of the Year story in September. "The only sustainable growth is consumer-demanded growth. Clearly, in a resourcefully strained world we need to think about environmental and social responsibility." Keith Weed, Unilever's chief marketing officer, told the annual Marketing Society conference in London in November. To widely varying degrees, consumers are considering sustainability at the grocery store, and even at the restaurant. "Local" seems to be a word that brings together low environmental impact, freshness and quality, as well as helping the nearby economy. The National Restaurant Assn. and American Culinary Federation, in their joint "What's Hot in 2012" survey, found among the top 20 menu trends: locally sourced meats and seafood; locally grown produce; "hyper-local" items; sustainability as a culinary theme; locally produced wine and beer; and sustainable seafood. Leatherhead, in its report, links some of the attraction of "local" to perceptions of quality and purity. "Consumers are more keenly aware of where their foods are produced and sourced," the report said. It's one of the more peculiar trends, strictly a business issue, and it may only be hot this year. But three of the largest American food companies plan to split in half during 2012. Any day now, Sara Lee Corp. will divide into two publicly traded companies, one focused on the international coffee and tea market and the other on North American meats. Names for the two companies have not been decided. In preparation, Sara Lee sold its large bakery business last year to Mexico's Grupo Bimbo. Just before Christmas, Sara Lee said the North American meat business would move corporate headquarters back to downtown Chicago, from suburban Downers Grove, in early 2013. 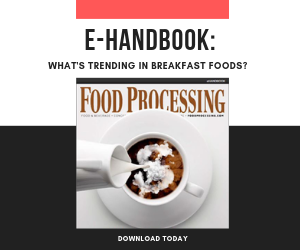 Food and beverage manufacturers are required to put standardized ingredients labels on products, but consumers with specific concerns about additives, preservatives, food coloring, HFCS, types of fats, and serving sizes are often confused. "Users have submitted more than 250,000 products and updates to the Fooducate database, which is the most comprehensive and current nutrition data source in the U.S. today, " according to the company. You can also read our Digital Editor's blog post about Fooducate. Ralcorp Holdings Inc., in the face of a potentially hostile takeover by ConAgra, responded in mid-2011 with a plan to spin off its branded Post Cereals business, which it acquired in 2007. That, too, should happen any day now. And behemoth Kraft Foods Inc. apparently is too big for its own good. The company paid $19.4 billion in January 2010 for Cadbury PLC after a long courtship. Now at about $50 billion in worldwide sales, Kraft said it will split, probably at the end of this year. One company will be a $16 billion North American grocery business – looking very much like Kraft-General Foods. The other will be a $32 billion global snacks business – think Nabisco-Cadbury-Jacobs Suchard. Both are unnamed so far. Lay the blame for all this on another semi-food company. Just over a year ago, Fortune Brands said it first, and made good on its promise last Oct. 3. Its kitchen products and lock and door hardware is now Fortune Brands Home & Security. Distilled spirits emerged under the name of its leading brand, Beam Inc. (for Jim Beam bourbon). Technology continues to change at a rapid pace, and it affects even the food & beverage industry. Although technology enables communication with and among consumers, the food & beverage industry has not yet embraced the promise of interconnectivity as an enabling next step the way other industries have. Business leaders are adapting to a considerable socioeconomic transition where the Internet, among other things, is creating a more educated and empowered world population. The upshot is that consumers play a powerful role in how consumer product companies market to them. Food prices will keep rising, predicts self-described "Supermarket Guru" Phil Lempert in a group of year-end predictions he co-authored with ConAgra Foods. "We will continue to see higher prices, but we will also see all the different ways Americans love their food - in supermarkets, on television, at restaurants and now even on their mobile phones. We are on the verge of what may be one of the most exciting and game-changing years in the food world." Price increases will lead consumers to use printable grocery coupons, frequent shopper cards and electronic shopping lists, Lempert and ConAgra predict. In addition, there will be increased shopping at non-traditional food stores and trading down to less expensive options. Look for consumers to shave costs by augmenting their recipes by decreasing the amount of the more expensive meats and seafood and adding more non-meat proteins that are filling and less expensive, including whole-wheat pasta, tofu, lentils, brown rice and vegetables to recipe. Will the gains made by private label the past two years continue? Or will brands regain status? Inevitable price increases loom, but the industry has traditionally competed for market share instead of conditioning consumers to pay for the value they receive (convenience, nutritional benefits, functionality, availability, fair trade, etc.). Perhaps addressing value with consumers is a strategy to be pursued. The economy will push brands into opening up more entry points for extremely cost-sensitive consumers as the "new normal" becomes a prolonged normal in the developed world. So says agency JWT in that year-end forecast of consumer trends. For instance, H.J. Heinz Co. is not a big fan of private label or dollar stores, but it has developed a flexible pouch for its Heinz ketchup that it can sell at or below $1 (as we revealed in our December Processor of the Year story.